I have been blogging like madness today. If you have been following my one movie a day blog, then you know I completed my self induced nightmare yesterday. Yes! I actually managed to get it finished. Yay me! And today, started the year long vampire blogging challenge over on my current all vampire blog. I did 2 challenge items - 3 posts including the "intro" to the challenge. And back on the movie blog... a short post for the movie club. Now, I'm also signed up for countless book challenges for the year. PLUS, my own book clubs. Can she see the top of the pool folks? I might be drowning in my own over eagerness to have a better year then last year. All I know is that it is 7pm right now, and I have a ton of stuff to complete before bed. I'm going to brave the still lingering holiday cinema crowds tomorrow to see The Hobbit while the city still has some matinees. And yes, I have gone on record before saying I did not care for the Lord of the Rings films. 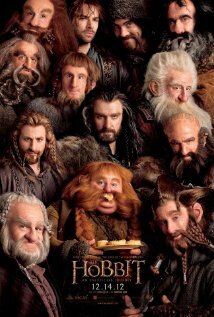 But, this looks good, and it's got Richard Armitage, Aidan Turner, Benedict Cumberbatch and Martin Freeman in it.